Hides JA, et al. Magnetic resonance imaging assessment of trunk muscles during prolonged bed rest. Spine (Phila Pa 1976). 2007 Jul 1;32(15):1687-92. Belavý DL, et al. 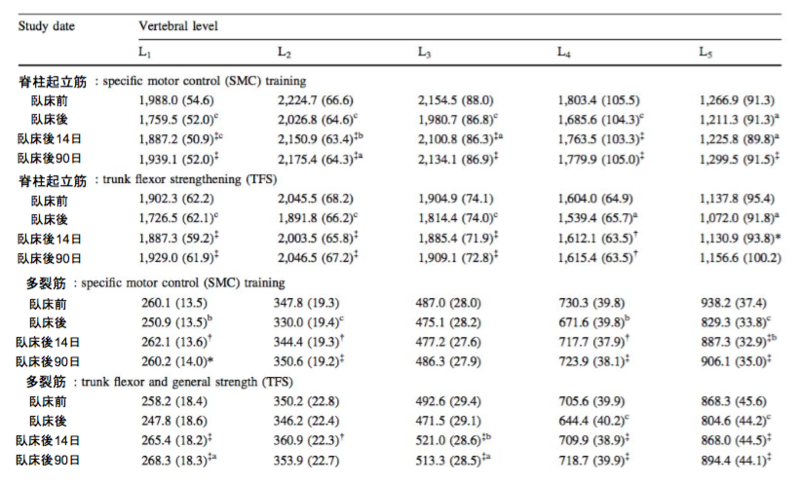 Influence of prolonged bed-rest on spectral and temporal electromyographic motor control characteristics of the superficial lumbo-pelvic musculature. J Electromyogr Kinesiol. 2010 Feb;20(1):170-9. Belavý DL, et al. Superficial lumbopelvic muscle overactivity and decreased cocontraction after 8 weeks of bed rest. Spine (Phila Pa 1976). 2007 Jan 1;32(1):E23-9. Hides JA, et al. The effects of rehabilitation on the muscles of the trunk following prolonged bed rest. Eur Spine J. 2011 May;20(5):808-18. Soderberg GL, et al. Muscular function in chronic low-back dysfunction. Spine (Phila Pa 1976). 1983 Jan-Feb;8(1):79-85.